Wednesday, May 23rd was a big day in Batman for me. 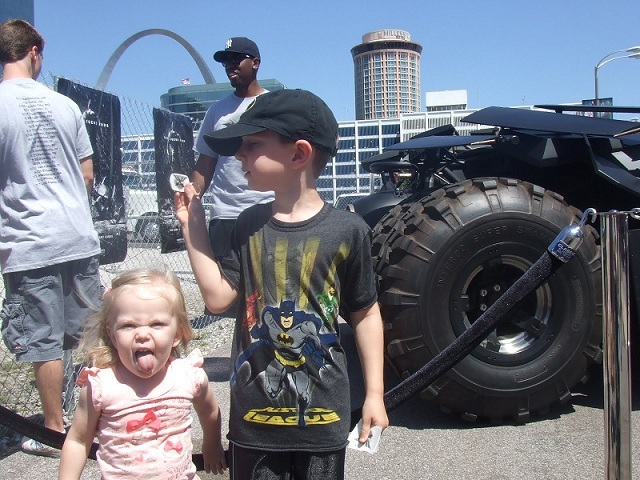 Not only was it the date of the Tumbler Tour in my city, St. Louis, but I also got to speak with famed graphic designer and Batman historian Chip Kidd. Even if you don’t know his name, you’ve surely seen his work! Mr. Kidd has designed the jackets of over a thousand books including Michael Crichton’s “Jurassic Park” (a design that was later used for the film’s logo) and Cormac McCarthy’s “The Road”. He’s also written his own books including “The Cheese Monkeys” and “The Learners” as well as a few non-fiction Batman novels such as “Batman Collected” and “Bat-Manga! : The History of Batman in Japan”. But next week is the debut of “Batman: Death by Design”, his very first original graphic novel. I just finished the book last night. And I liked it. It had a nice old school Bill Finger, Bob Kane vibe. Yeah. Yeah, it is very old school. Especially in the storytelling and the art was great. How did you and Dave Taylor come together on this? Mark Chiarello put us together–our editor at DC– and it was a very happy collaboration. I had been familiar with Dave’s work from a short story– Origin of Robin retelling that he had done in the mid-90s for the 100th issue of “Legends of the Dark Knight” and I had just loved that. And, you know, we were very, very lucky to not only find the right person art-wise but a great person who could devote three years of their life to it! Yeah, I liked how it’s pretty much just pencils. Yes! It’s all just pencils! And then he scanned that in and then he adds some lighting effects and a little bit of color. At the forward of the book, you cited the inspiration for the story as the 1963 demolition of Penn Station and the crane collapse in Manhattan back in 2008. Since they’re both fairly more recent events, why place your story in the 1930s? That’s a very good question. Because that was an era that I find visually rich with possibility and it’s the original era of Batman, actually. And I hadn’t felt like I’d seen a lot of Batman stories set in that time. So it seemed like ripe territory for us to have fun visually even though it is based on relatively current events. The basic themes are, ya know, rather eternal. Ya know, corrupt city government and all that. Yeah, there’s definitely a demand for it. Because just while back I asked a bunch of readers if they could see Batman in any other era other than modern times– it was overwhelmingly 1920s, 1930s. Would you be interested in writing a modern Batman story or would you want to stay in the 30s? Yeah! It’s funny, I’m sort of a “wait to be asked” kind of person and basically Dan Didio said to me, kind of out of the blue, “You should do a Batman story for us!” and it was allowed to be set out of continuity so that is what I chose to do. But if they were to come to me and say, “Okay, do something that happens now.” That would be great, that would be a really fun challenge. I would love for there to be an ongoing series that takes place in the 30s like this because there’s not a lot of—there’s like…nine? Maybe a dozen different Batman comics out right now and too many of them feel the same. So one of the things in the book that I liked was this one line that Bruce had in a thought bubble, which by the way you don’t really see the thought bubble that much anymore. I know! Everyone does thought boxes now! Yeah, I like it but anytime I see it anymore it’s surprising, “Wow! I forgot about these.” It’s like writers have forgotten how to use them or it’s gone out of fashion. But there was a thought bubble that was Bruce saying “I’m much, much better with people I can’t stand.” And I thought that was really funny and true and it made me think about how in recent years, writers like Grant Morrison have tried to make Bruce a bit less of a loner. But how alone and brooding do you prefer your Batman to be? Well, that’s a good question. I’m actually not a huge fan of the alone and brooding thing. It’s not the Batman I grew up with, frankly. I think there’s…just with anything else there’s a balance to be maintained. The reason he sort of says that is it’s kind of true! As Batman, he’s much more used to dealing with enemies as opposed to allies so you know, that was just kind of like a dig at that and maybe he’s not so good at the interpersonal thing. Speaking of allies, you didn’t use Gordon in the story. No, I know. There were lots of decisions like that that had to be made given the limited page count and also the freedom to invent a couple of characters which I really, really wanted to do. And so he sort of got…I mean you can’t ignore Alfred unless you just wanna not have him exist so I had to have him there. And I like him and I think he plays a key role in how Batman functions, but Gordon just simply isn’t part of this picture or this story. It would have been nice to have tried and involved him. He’s mentioned offhand toward the end but, ya know, I had to sort of decide what characters to work with. –And I mean, I love him! He’s a great, GREAT, wonderful character. That goes without saying. Yeah, you can’t like Batman and NOT like Gordon. And you mentioned working within the confines of the limited page count and I think that was probably the one weakness that stood out the most in the book was that I felt that it could’ve been longer. I would’ve liked that, although one could also argue that if it was longer we’d still be waiting for it to come out! YES, I would’ve liked it to be longer. There’s this scene at the end where Batman finally confronts the original architect that was supposed to be like a three or four page scene that really dug into these themes of design and how you design your life and, and, ya know, etc., etc. It got reduced basically to one page just because I needed to fit other stuff in including the epilogue. But yeah, I wish it would’ve been longer too but at the same time it’s been three years and I wouldn’t want it to be any longer in the waiting for it either, so that’s kind of the upshot of that. The character Cyndia looks a lot like Grace Kelly to me. And Garnett Greenside looks exactly like you. …that’s correct! [laughs] He looks like me minus about twenty pounds. That’s what comics are for! Yes. Yes, it is pure narcissism, but ya know, there is a kind of literary tradition to that like Kurt Vonnegut used to work himself into his own short stories and that kind of thing—not that I’m comparing myself to Kurt Vonnegut—but that was too good to pass up. Are there other characters in the book modeled after real people, especially people that you know? I mean, Bruce Wayne is roughly modeled after Montgomery Cliff. I would’ve and should’ve done more of that. The union boss—I probably shouldn’t even say this, but—the union boss is modeled after this guy named Bernie Kerik. I think he’s different enough that, you know we couldn’t get sued, but he’s sort of the inspiration for that character. I don’t know if you know who that is but he’s this notorious New York figure who Bush had recently cast to be the head of National Security and then he got sent up the river because of all this shady stuff he was doing. Uh-huh. Once I started recognizing Grace Kelly and you I tried looking for more recognizable face and I wasn’t picking up on them. I was hoping for like a Peter Lorre or Jimmy Stewart because I had seen that YouTube video of you doing impressions of them. Oh, right! Yeah! It’s fun to do that stuff. Older Gregor Greenside is basically Gary Cooper in “The Fountainhead” i.e. Howard Roark as a burnout. Um…The Joker is basically Conrad Veidt in “The Man Who Laughs” with a bit of tweaking. He’s a great old German expressionist, 1920s silent movie villain. I remember seeing that one now, too. Peter Lorre would’ve definitely had a good look for a Batman film back in that time. He would’ve been great as The Penguin, actually. So you’re known as being a pretty big Batman historian, you have a really nice collection of Batman memorabilia, what’s the crown jewel of your Batman collection? Oh my God…Well, I’m happy to say it’s really difficult to point to any one thing. At this point I would say: I’ve got a collection of original art from various projects that I’ve shared work with or people I’ve worked with like Alex Ross and Frank Miller and Darwyn Cooke… Frank Quitely…it’s…it’s uh, ya know, I love all of that. Goodness, it’s up on the wall and I look at it every day! But there’s lots of stuff. Earlier we were talking about how easy it was for me to recognize you just as a drawing. Do you ever get recognized on the street by fans and what have been your best and worst confrontations with fans? Haha! Um…I’m trying to think of a bad one, but I never cease to be amazed at every now and then somebody does recognize me and comes up and says hello and I’m always sort of delighted and amazed and um…I can’t…I can’t think of a time when–[laughs] well, you probably wouldn’t want to put this in your interview, but the most awkward time anyone ever came up to me and said “Hi! Are you Chip Kidd?” was in the shower at the YMCA about fifteen years ago. And it was a writer who had recognized me from some article and I ended up designing his book cover which was pretty bizarre. So how do you feel about comics in the digital age moving on to being read on phones and iPads? Ya know, I think if that helps facilitate keeping readers and getting more readers, I have nothings against it. Personally, that’s not how I want to read comics. I would also say, on the other hand, putting this particular book together was all done over email and Dave would send me .jpegs of how the art was progressing and it looks fabulous onscreen. Like, when it’s done it’s absolutely gorgeous so there’s an argument for that. So, ya know, I’m very much an ink on paper print guy but I’m very much for getting more readers to comics so if that requires digital output on iPad and phone and whatever, ya know, fine go for it. It would just be sad if that meant print comics would cease to be. Do you have any upcoming projects that you can or can’t talk about right now? I did a DC Comics sketchbook with Alex Ross. I edited it and designed it; it’s called “Rough Justice”, that comes out in paperback in about a month. At Pantheon, as an editor, we have these two amazing projects coming out in the fall which is a massive Chris Ware graphic novel project called “Building Stories” and Charles Burns’ part II of his “X’ed Out” saga so that’s all very exciting, and there are various other projects I’m working on. Do you have a certain routine you go through on a creative project? Like you listen to a certain type of music or shut yourself away from the world for a certain amount of time? It. All. Depends. If there’s writing involved, which certainly there was on “Death by Design” that was my major role in it. Ya know, I don’t know why anybody would care, but usually silence is the best thing to work to. Sometimes music but never anything with words, it just gets tangled up in your head. It interferes with the process. But other than that it’s kind of all over the place. I have an office in midtown which is where I am now and that’s where my main work station is, but if I’m writing or what have you, you can sort of work from anywhere. How long did it take you to write “Death by Design”? Maybe three months? From initial ideas to final script? The thing with Dave that first frustrated me a little bit but then I quickly understood was that…I was so itching to get started and I sent him the premise, and here’s who the characters are, blahblahblah and I wrote the first ten pages or something and I wanted to get started on the pages right away and he said to me, ya know, “I’m sorry but I need you to complete the entire script before I really start in earnest. And that was interesting and at first I thought, “Well, why?” and then we talked about it and ya know, [Dave said] “I want to be able to work on the entire thing and see exactly where it’s going and how it’s gonna end up and that will work best. That’s how I start it.” Ya know? That was interesting! And I think in a way—in several ways, that was good but it did force me to kind of, um– I probably wrote it quicker than I would have otherwise. Like, if I, you know, if he would’ve started with the first half of it while the second half was not written it probably would not have forced me to finish it as quickly as it did. What are your opinions on the future of Batman? Ya know, it seems to have an endless font of possibilities creatively and I think that–I wrote in “Batman Collected” fifteen years ago or something—Batman and these characters, they are as vital and interesting and exciting as the people who are working on them and as long as you’ve got really talented, smart, visionary people working on this stuff the future is very bright. Which, obviously with Christopher Nolan that is what happened there and my friend Glen Murakami is the head art director of the “Beware the Batman” show and I’ve seen a little bit of what he’s coming up with and I think it’s very, very exciting. And in that sense, the future is very bright because all of these things generate new generations of fans who are in love with it and want to work on it. Yeah, like you’re saying there are these generations of fans who, ya know, have these fictional heroes in their childhood with these stories that are so fantastic that they dress up as ’em for Halloween—I know my mom made my Batman costume from scratch and I still keep that somewhere—and they collect the toys, but then they go to high school or reach college and they get over it. But for people like you and me—we’re not over it yet! So why haven’t you gotten over Batman? –Neither do I! But you’ve been a Batman fan longer than me so I was hoping you would know! …I just find it to be a source of endless…sort of fascination on many levels: aesthetic, there’s a certain moral code to it that I appreciate, there’s an escapist element to it that’s very appealing, and, again, I tried to get into this at the end of “Death by Design” just that Batman has built this very interesting design solution to a very potentially devastating problem which is, ya know, how do you go on living? [How do you] pull yourself out of the depths of despair and reinvent yourself and I think a lot of us have to do that in our lives from time to time and I think you can relate to that aspect of it, too. There’s lots of different reasons. It’s in a lot of ways hard to analyze but yeah, it’s weird. At this point I feel somewhat vindicated because of the continued widespread popularity and that in my generation it’s not longer considered a stigma to be into this stuff. Is there a message at the end of “Death by Design” that you’d like people to walk away with? Um…I think…hmph! This is not very exciting, but I think a big part of the message is that preserving architecture is important and I think most major cities have historical preservation councils but certainly New York did not until Penn Station was destroyed. And not to belabor it but, as someone who goes in and out of Penn Station all the time, it’s just, ya know, it’s just horrible and they’re trying to rectify that. They’ve got the plan in place, but cities have to accommodate people and city governments need to understand that and I think they think they do…until it all breaks down. So I don’t know if that makes sense but that’s part of the message. One last question: when’s your website going back up? That is a good question! I’m working on it. I’m hoping within the month. I’ve got somebody working on it and I’ve seen several prototypes of it now and it’s very close. But thanks for asking! Thanks again to Pamela Mullin and Alex Nagorski at DC Publicity for making this interview possible and Chip Kidd for taking the time to chat with me about The Caped Crusader! Death By Design will be available this Wednesday, May 30th.